It was there that we met the Pokegama Bear. When out popped the monstrous Pokegama Bear. To capture or kill the Pokegama Bear. He slipped and fell on the Pokegama Bear. For fate was against that Pokegama Bear. And he dealt the death blow to Pokegama Bear. Of the oil that was in the Pokegama Bear. As he feasted upon the Pokegama Bear. Since it’s greased with the fat from Pokegama Bear! I am not the first Minnesotan to be fascinated by old songs that drifted into our state during the old time logging era of the 1800s. Iron Ranger John Berquist (once Minnesota’s state folklorist) was very active for much of his life in the revival and performance of regional folk music and performed several logging camp songs including “The Pokegama Bear” (pronounced “po-KEG-uh-muh”). I only had the pleasure of meeting John once before he passed away in 2016 but he was a friend to many in the Twin Cities music community and collaborated many times with Twin Cities mandolin player Bob Douglas. I am not sure where John found the text of “The Pokegama Bear” but it is printed in Agnes Larson’s wonderful 1949 book The White Pine Industry in Minnesota as contributed by Michael McAlpine of Grand Rapids, Minnesota (who appears in the song). The song was composed by Frank Hasty (who also appears in the song) in a logging camp in 1874. The bear’s namesake, Pokegama Lake, is just south of Grand Rapids. 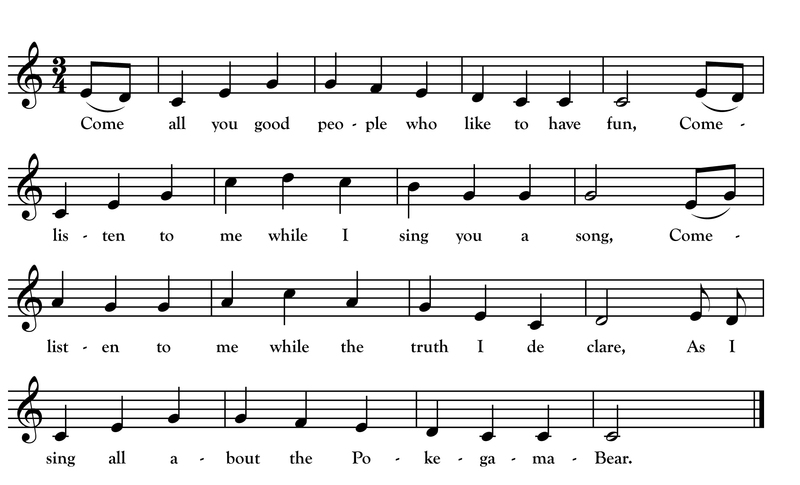 John Berquist set the text to the “Sweet Betsy from Pike” tune so common in the lumbercamp tradition. John performed the song and gave it to Chicago folk singer Art Thieme who recorded it. I use a variant of the same tune with a couple tweaks inspired by “The Journeyman Tailor” – another song with the “Betsy from Pike” tune that was collected in the north of Ireland and printed in Sam Henry’s Songs of the People.